Joliet City Hall is located at 150 West Jefferson Street, Joliet IL 60432; phone: 815-724-3700. Photo: House in the Upper Bluff Historic District, Joliet, IL. The Historic District was listed on the National Register of Historic Places in 1991. Photographed by User:Smallbones (own work), 2011, [cc-by-1.0 (creativecommons.org/publicdomain/zero/1.0/deed.en)], via Wikimedia Commons, accessed July, 2014. Joliet, although located partly in Kendall County, is the seat of government for Will County (Yorkville is the Kendall County seat). The village of "Juliet" was laid out by James B. Campbell in 1834. It incorporated as a village in 1837. 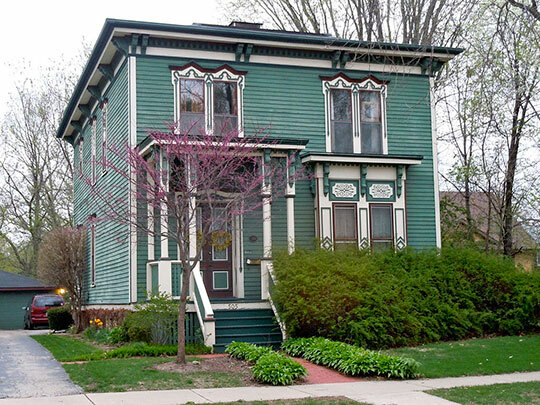 The name was changed to Joliet in 1852, and the village was reincorporated as a city. Once known for its limestone quarries and steel mill, the area declined through the 1970s and 1980s, but began a rebound in the 1990s with the creation of a NASCAR race track and riverboat casinos. Joliet is about an hour (approximately 40 miles) by auto or commuter rail from downtown Chicago.